The deadlift is one of the most difficult and challenging lifts in weight training. There are a lot of things to consider in this movement such as core engagement, shoulder retraction, foot position and so on. However, besides that, you should determine which shoes to wear. I’m pretty sure that most of you have ever done squats or deadlifts in running shoes. That is a big mistake, so if you’re one of them, fix it right now. And if you’re looking for the best deadlift shoes, then you’ve just come to the right place. Why Wearing Running Shoes Is Bad For Lifting Weights? Basically, choosing a pair of deadlift shoes is not much different from choosing a pair of powerlifting belt. This is because it basically comes down to your preferences. But if you don’t know where to start, here are some of the factors you should consider if you want to choose the best deadlift shoes. We can think of running shoes as all-purpose athletic shoes. Therefore, it’s fine to wear a pair of running shoes on a chest workout or cardio workout. However, it doesn’t mean that wearing them for deadlifts and squats is a good idea. In fact, it’s very dangerous to wear those shoes whenever you perform a movement in a standing position. But why? Why shouldn’t you wear running shoes to lift weights? Okay, first, we need to take a look at the design of running shoes. Well, basically, typical running shoes are cushiony with a thick sole and thin toe. Due to this design, you are like to fall forward in these shoes. Besides, these shoes also feature heavy arch support so your feet can’t be stable in them. And you know, the more unstable, the more dangerous, especially while you’re lifting heavy weights. Now, someone will say that “I feel comfortable in my shoes and nothing happens when I lift weights”. Well, if that’s the case, then I’m pretty sure that you’re not a serious lifter or you don’t lift heavy enough to have the problem. Some people are aware of the risk of getting injured when deadlifting or squatting in running shoes so they wear flat-soled shoes instead. Actually, these shoes are not designed for weight lifting but they have flat sole and there is no arch support. To be honest, this is not a bad idea in case you don’t have to spend any money for a pair of weight lifting shoes. However, weight lifting shoes are still the best option because as the name suggests, they’re designed for this. For me, these specialized shoes may not look fashionable or attractive at all, instead, they have a bulky appearance. However, their heels are just a little bit elevated so they can provide you extra stability and safety for squats and deadlifts. Therefore, if you are serious about your training and fitness or you care about your own safety, it’s important to have these shoes. But have you ever seen someone deadlift without shoes? Actually, compared to running shoes, deadlifting or squatting barefoot is even way better and safer. But trust me, I know how it feels when someone drops a 45-lb weight on your foot. To be honest, that can be one of the most terrible moments in your whole life. So, again, it’s best to wear weight lifting shoes for deadlifts and squats. Basically, choosing a pair of deadlift shoes is not much different from choosing a pair of running shoes. And if you don’t know where to start, here are some of the factors you should consider if you want to choose the best deadlift shoes. No one wants to deadlift 400 lbs in a pair of shoes which is too tight or too loose, right? Therefore, just measure your feet thoroughly so you can get the right shoe size. Also, don’t forget to read a couple of customer reviews about the product so you can imagine how it will fit you. Make sure the shoes you are going to buy can last for a long time, not only a few months. Actually, I’ve been using my deadlift shoes for more than 3 years and they still show no signs of wear and tear. For durability, again, just read the reviews so you will know what other users say about the product. In my opinion, synthetic is one of the best choices. When it comes to sole, there are different choices such as rubber, synthetic, wood, plastic, and leather. Actually, it comes down to your preferences. However, rubber shoes are the most common as they are both hard enough and supportive for lifting heavy weights. Also, rubber heels are more durable than wood and leather ones, so I suggest you go for rubber sole. Additionally, make sure that your shoes have a removable insole so it can be very easy for you to wash and clean the shoes. 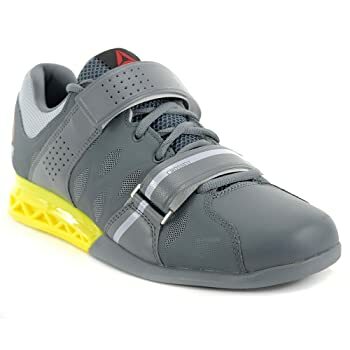 Generally, weight lifting shoes usually come with the same lacing system including hook-and-look closures. Overall, most models come with only 1 strap around the upper part of the shoes while some others come with 2 straps. Therefore, if security is your big concern, then you can go for shoes with both higher and lower or mid-foot straps for extra security. To be honest, single strap units can provide great security actually so it’s all about your preferences. Besides, some models come with a dial which makes it easier for you to tighten the shoes but it all depends on your preferences. Last but not least, this is a very important consideration you may think about when choosing the best deadlift shoes. The right heel height may help optimize your comfort through different movements like squats and deadlifts. In fact, lifting shoes have the standard heel of .75”, however, there are other units which have .6” heels or even a 1” heel. A taller heel can allow you to reach the range of motion at your ankle while the lower is helpful for those with short limbs. For me, you shouldn’t choose deadlift shoes with high heels unless you have poor ankle mobility. In fact, if you just do general fitness, just go for .75” models as they are suitable for a wide variety of movements. This product is one of the best deadlift shoes for anyone. These shoes feature a raised heel, hence, providing great mobility at the ankle. The body of the shoes is made of synthetic/mesh material so it is quite durable. Besides, these shoes can keep your feet cool due to good air circulation. Additionally, this product is a little bit wider than others at the same size, hence, you may feel much more comfortable. Like other models on the market, they feature a lateral strap for extra rearfoot integrity. Also, with the single strap, you will find it very easy to tighten the shoes. What I like most about this product is that it has high-density midsole wedge. And as you already know, deadlifts and squats are all heavy lifts requiring great balance and stability. Without them, you’re likely to have injuries and that can be very dangerous. The downside of the product is that the lateral strap is located too far up, very close to your ankle. Generally, that can cause a lot of friction in the area so it’s not really comfortable. Furthermore, the elevated heel may be suitable for those with poor ankle mobility but it is not really effective when lifting heavy. My first impression of this product is that it has dual hook-and-loop closures. That means you can make sure that there is no “wiggle” room and these shoes never get loose while you’re lifting heavy weights. Hence, if safety is a big concern for you, then this one can be your best bet. Like other models, this one features a rubber base which is nice, strong and supportive for heavy lifts. Also, these shoes are made of leather on the toe and they have the anti-friction lining as well. Therefore, they are very comfortable and you don’t have to worry about the shoes rubbing your feet during the lift. The shoes also come with an elevated heel so if you have tight hip muscle, this is great for increased mobility. Honestly, not that it matters but they look really nice and attractive. However, the downside of these shoes is that they’re too stiff so walking around the gym with them is not a good idea. My suggestion is that you should bring another pair of shoes so that when you finish squatting or deadlifting, you can use them. Furthermore, what I don’t like about them is that the rubber in the heel will probably separate early on. That’s why you may need to glue them back when it happens. The straps are not high quality as they feel like a cheap vinyl type. Now, you may wonder why I put this one on the list but yes, you’re right. These shoes are not designed for deadlifts or squats. However, these shoes can be the best deadlift shoes for those who don’t want to spend much money on expensive specialized shoes. Remember that they’ve remained popular among lifters all over the world for years and it doesn’t look they’re going away in the future. As you can see, they have a flat base which is very suitable for you if you don’t have poor ankle mobility. Of course, their base is not supportive and thick as compared to real weight lifting shoes. Actually, to me, squatting in flat-soled shoes is also stable and you don’t have to worry about falling forward when losing balance. Besides, unlike weight lifting shoes, you can totally wear this one to walk around comfortably. Furthermore, the price can’t be beaten so if you are not a professional powerlifter, then this can be a good option for your training. Well, at least, it worked pretty well for me. Choosing the best deadlifts shoes is not a difficult task, actually, it all comes down to your personal preference. Just make sure it fits you perfectly and you can deadlift comfortably with them. 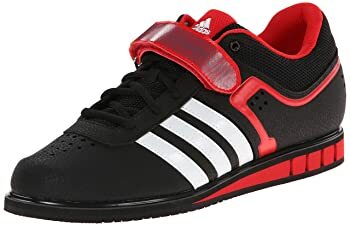 In my opinion, if you’re not on a budget, then the Adidas Performance Men’s Powerlift is the best choice. 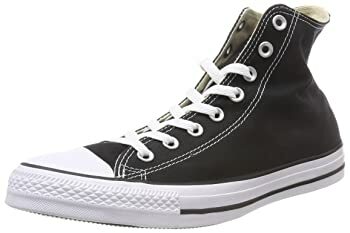 On the other side, if you don’t want to spend that amount of money, then Converse Chuck Taylors can be your best bet. Besides, to support your workout, especially deadlift, your hands have to be strong, therefore, a hand grip strengthener will have you this situation.